New York City can be such a magical place during the holiday season. There are so much more bright lights coloring the streets and an endless amount of cheer in the atmosphere. Just wait until the tree lightings come full swing! Soo.. 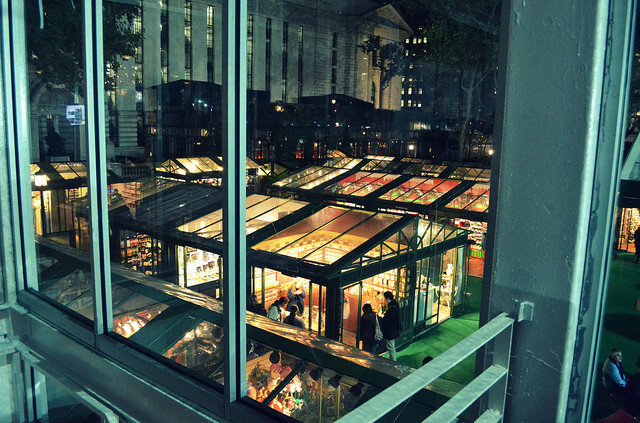 I was invited to experience The Holiday Shops over at Bryant Park. To be honest, I’ve never really shopped there until this year! Sure I’ve been there to skate and the shops over at Union Square, but not Bryant Park. Gasp! Gasp! I’ve been missing out. For serious! I gathered my blogger pals, with treasure map in hand, and proceeded to taste what The Holiday Shops had to offer. On the agenda: Kettle Corn NYC, Pickle Me Pete, Crepe Cafe, Wafels & Dinges and Diggity Diggity Dog. I can tell you right now that I’ve had some of the best food, ever! If you go, you must try the kettle corn and nachos dog. Oh… I wasn’t a pickle believer until that night. There are a plethora of stores. 120 of them to be exact. Here’s a sampling of my favorites of what’s in store for you at The Holiday Shops! I’ve always loved Sabon! So I’m very happy to see them there along with Molton Brown. Their products always tickle my senses. I am new to Shea Moisture, but I love Argan Oil. Simply from being about to read the ingredients on the front of the packaging makes me love them. So here comes the motherlode. I went back to shop some more and am SO happy with my purchases. Jewelry! Left to Right: JuLi Ra Design bracelet, Vivi Sun earrings, bow necklace from Ohh La La, Jessica DeCarlo stackable garnet ring and Jessica DeCarlo crystal gunmetal necklace. Mildly obsessed with my new finds, especially Jessica’s handmade pieces. She is at the shop most of the time and you can also find her at the Brooklyn flea on Saturdays. …and this number. A Flying Tomato lace + vintagey print kimono sleeved wrap from the Ohh La La boutique. So in love! Hope you have as much luck and fun at The Holidays Shop in Bryant Park as I did. I’m pretty sure I’ll be back to skate at Citi Pond. More pics from the night are on my Facebook.